Today we are featuring 4 woodworkers in our Follow Friday blog. These 4 gentleman all had features in our March Issues of both Wood News and The Highland Woodturner. #1: Don Henderson-This month we featured Don’s workshop in Orleans, Ontario in our Show Us Your Shop column. Don’s shop is more recent, having been designed and built in the basement of his new house when he recently moved. 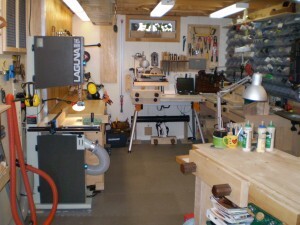 His shop consists of the main shop area, and then several annexes that act as storage as well as home to several bigger pieces of equipment including his tablesaw, jointer/planer, and a second bandsaw that is dedicated to just curve cutting. A lot of Don’s woodworking focused on the restoration of old wooden boats, which you can see HERE. #2: Peter Fabricius– In each issue of The Highland Woodturner, we feature a woodturner’s woodturning projects and/or their shop. This month we featured the woodturning and story of Peter Fabricius, a veteran of the Canadian Armed Forces who retired in 2006 and was able to solely focus on woodturning upon retirement! When Peter creates a piece, he focuses on 3 factors: interest, beauty, and functionality. 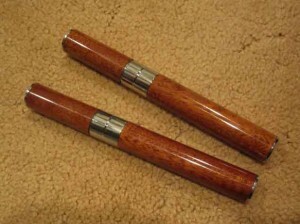 In addition to the cigar holders featured below, several more of Peter’s woodturning projects can be seen HERE. #3: Pat Ring– Pat has gained his woodworking knowledge and expertise from a variety of woodworking schools, instructors, and organizations including the McLaughlin Woods Woodworking School, Garrett Hack, The New Hampshire Furniture Masters Association, Joy Valley Woodworks, and the Center for Furniture Craftsmanship. You can see a variety of Pat’s projects HERE, as well as the custom-made lapsteel guitar case below. #4: David Tidwell– David is an army veteran who got into painting while stationed in Fort Benning, GA. He didn’t get into carving until he one day decided to whittle a random pine knot he found in his yard. He turned the pine knot into the face of an old man and thus started a carving career. 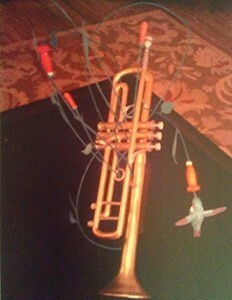 David carves a variety of objects including animals, fish, birds, and faces (as well as an entire trumpet, seen below). You can see more of David’s carvings HERE.